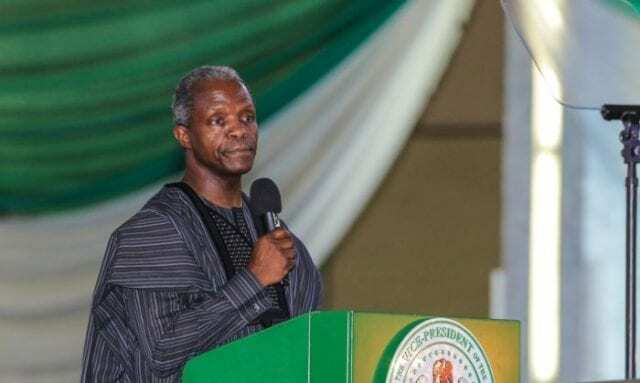 Yemi Osinbajo has said that President Buhari has been growing the Nigerian economy despite the many challenges the country is facing. According to Punch, Osinbajo also said that all the presidential candidates of the Peoples Democratic Party (PDP), put together cannot defeat Buhari. He also called on the people of Akwa-Ibom state to have faith in Buhari’s administration, adding that things will soon be alright. “I came to thank Akwa Ibom people for their remarkable show of solidarity. I came to tell you that the government of President Muhammadu Buhari loves the people of Akwa Ibom. “I want to put on record that the entire South South has been taken over by APC-led government. I can assure you that the heart of the President and that of the acting President are with you,” he added. Oshiomhole also told Akpabio that the President and all APC members welcome him heartily. Meanwhile, the chairman of the PDP, Uche Secondus has described as unfortunate, Akapbio’s defection to the ruling party. Secondus wondered why the Senator will move to a sinking ship. ITExpertWebinars' Free Webinar Titled "Begin a Career in Information Technology (IT)"